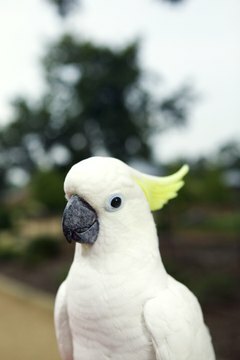 What Should a Cockatoo Habitat and Aviary Consist Of? Cockatoos are escape artists, so be sure the cage is secure. Cockatoos are not for everyone, but if you simply cannot live without one of these entertaining and intelligent birds, you owe it to your fine-feathered friend to provide everything his physical and mental well-being requires. Your cockatoo's housing should provide safety, comfort, and plenty of interesting activities. Your cockatoo's cage should be the largest you can afford and fit into your home. It stands to reason that a smaller cockatoo can have a somewhat smaller cage, but only if a larger cage is unrealistic for your situation. The minimum size for a cockatoo cage is 27 by 27 by 39 inches. A better size is 36 by 36 by 48 inches, and larger is better still. When in doubt, a good rule of thumb is that the cage should be three times the bird's wingspan. It should have horizontal as well as vertical bars, and should be durable and easy to maintain. Furnish your cockatoo pal's habitat with items that will make his days pleasant and enhance his life. Keep the habitat clean. Provide at least two perches, each 9 inches long and between 3/4 and 1 inch in diameter. Do not place perches over food and water dishes, which should hang on the side of the cage and be easily accessible from the outside. Avoid plastic food and water dishes. From time to time, provide a large ceramic bowl on the bottom of the cage and fill it with water, so your cockatoo can bathe if he wishes. Put plenty of cockatoo-specific toys in the cage, such as ropes, chew toys, branches from outdoor trees, swings, and other suitable playthings. Cockatoos love to play and exercise. If you don't provide a safe place for your cockatoo to explore, you will have one very sad cockatoo indeed, and that will make life miserable for everyone in your home. Provide a playpen that your feathery friend can get to from his cage by climbing through the open cage door and either to the top or the side of the cage. Such playpens are sold at pet stores and specialty shops. You also can make your own, using tree branches, perches, ladders, toys, swings and other interesting objects. Be sure to provide new toys frequently. Not everyone has room for an aviary, but if you can fashion one out of a screened patio or a spare room in your home, you will be doing yourself and your cockatoo friend a big favor. A screened patio is best, or you can build a free-standing aviary. The enclosure should be screen, not glass. Provide plenty of perch-like places for your pal to rest after flying. Placing a bird bath and play pen inside the aviary is the ideal way to give your bird plenty of enrichment opportunities and play time. Birds are flock animals. Unless you have two cockatoos to keep each other company, you are your buddy's flock. Don't just turn your cockatoo loose in the aviary with a "see ya later" wave, thinking he's got all he needs: Stay in there and interact with him. The quality time you spend with your pal will go a long way toward building a bond with him. It also helps ensure your lonely little cockatoo's well-being.